Kodi addons are great in number. Hence they tend to vary in their quality. Kodi is no more an open source and free media player. It has become more than that. It is now a full-blown home theater software application. Kodi allows millions of people around the world to stream different types of media from a wide range of online sources. The problem with these is that many of these sources don’t come pre-installed with Kodi. In other words, you have to install them yourself. So, if you want to start your journey of binge-watching your favorite TV shows and movies then you need to install a couple of Kodi TV and movie add-ons. But before you begin to search for your favorite TV and movie streaming Kodi addons, we want you to know some things. During your journey, you will likely come across two types of Kodi addons. The first kind that you’ll come across are the official Kodi addons. These come from the official Kodi Addon repository. Yes, that means you can access all those Kodi addons from the same place, no matter where you are. The second type of Kodi addons that you will come across is the unofficial Kodi addons. These are basically third-party repositories that users can access via Kodi. Remember, that the developers of these Kodi repositories have nothing to do with Kodi itself. You may have heard about these add-ons in the form of Covenant and/or Exodus. Official Kodi addons and repositories are safe. In other words, many of these third-party Kodi addons carry with themselves a significant risk of hacking. So users should always prefer Official Kodi addon repositories over third-party Kodi repositories if they are concerned more about their security than the quality of content they can watch for free. Hackers are always read to hack third-party Kodi addons. And then they can use the same Kodi addons to spy on the user who is streaming content via that Kodi add-on. They can know your online habits as well as the stuff you have watched via Kodi. Third-party Kodi addons have a lot of other problems as well. Sometimes they can carry with themselves different forms of malware. They can program their Kodi addons in such a way that the malware can silently push itself on to the Kodi user’s device. And that can happen even if you took precautions such as installing the add-on from a, what seemed to you at the time, a trustworthy Kodi source. What we want you to understand is that no one can fully vet third-party Kodi addons for you. Hence, they carry significant security and privacy risks. This super guide will show users how to watch TV series and movies using Kodi. We’ll also list how you can install some of the very best and most popular Kodi addons for movies and TV show streaming. After that we’ll describe how using Kodi means you’ll have to deal with some privacy concerns. Remember, even some of the most popular third-party Kodi addons carry the risk of malware. Both movie and TV add-ons are inflicted with these problems. Towards the end of the guide, we will show you some helpful content on the most popular third-party Kodi addons for TV shows and movies that may also find elsewhere. We will then give readers an explanation of what those popular add-ons are and what do they do. In this way, you will learn how do they stream content. And more importantly, which Kodi add-on provides what kind of content. Rules and regulation vary from each given country to the other. Hence, we recommend to all Kodi users who want to stream content via third-party Kodi addons to check if the “Free” content that they are offering is legal or not. Moreover, even if the content is legal, you should also check if your government allows you to view that kind of content for free in the region where you live. Now, comes the Expert Tip. It doesn’t really matter which Kodi addons you end up using. We recommend our readers that they should always take advantage of a reputable and fast VPN service. Especially when they want to stream video content via Kodi. VPN services will keep your data safe and private while you do your thing online. The Kodi community has given a lot of love to a lot of VPN services. But our research shows that the best VPN service for Kodi users is IPVanish. IPVanish has the ability to work with any and all Kodi addons. Moreover, it also works with the most popular Kodi addons for devices such as Amazon Fire Stick and others. If you sign up with IPVanish for the right period of time and catch one of their discount seasons, then you can save yourself a lot of money. Now, you can’t just go ahead and install Kodi addons. First, you have to set up the repositories that these Kodi addons need in order to work. What is a repository then? A library that contains a lot of Kodi addons. And using a repository, Kodi users can install any Kodi add-on that the library has at will. That too from within Kodi. No more going to different websites and sources to get the add-ons and then the dependencies of those Kodi addons. It is true that some Kodi repositories do require the user to go through a manual installation process. But there are other Kodi repositories such as Fusion which allow users to make use of a simple and straightforward add-on installer. Kodi users who want to hide their private streaming activities from entities such as internet service providers and government agencies usually turn to services such as VPN. With that said, there are a ton of other reasons why one would want to use a VPN service. VPN services especially suit people who like to stream content from Kodi. Nothing should be more important to you than the protection of your data. The thing is, when a user downloads and installs a given Kodi add-on, she/he may inadvertently expose his/her computer machine to snooping. Hackers can also easily hijack Kodi addons. Then they can use those add-ons to install malware on the Kodi user’s systems. They also use man-in-the-middle attacks. These are basically advanced hacking methods. Such attacks allow hackers to monitor all of the user’s activities online. Needless to say, Kodi users need to make sure that they don’t expose their computer machines to hackers and snoopers. And we all know what snoopers and hackers want. And they want the associated passwords. VPN services also help users to view geo-locked content. There are a ton of streaming services on the internet. And some of them don’t want to allow everyone on the planet to view their content for their own reasons. In short, some streaming services only work for people in certain countries. A VPN service has the ability to solve a lot of problems related to geo-blocking and censorship. How does a VPN service do that? In other words, it encrypts all the outgoing traffic of the user. No data comes in or goes out without first going through the encryption process. This is mean third-party actors such as internet service providers and government agencies can’t know that you are doing on the internet. While it always helps if you exercise more vigilance and make use of antivirus software applications in order to detect malicious Kodi addons, you will definitely need a VPN service to prevent those nasty man-in-the-middle attacks. The methods that VPN services use to preserve the user’s privacy work against all types of hacking attempts. Users should make sure that they use Kodi to view content that they have acquired the legal right to. They should not access content that they don’t own. Neither Security Gladiators nor the Kodi Foundation advocate people to use the Kodi platform for illegal purposes. Below we will start to list several Kodi addons that you can easily find in the Official Kodi Add-on Repository. You can also find these add-ons on many other website resources. So don’t worry if you can’t find them at the location that we mention here in this guide. The most important thing you need to remember here is that none of the Kodi addons that we mention below provide Kodi users with illegal content. We always start off by recommending these Kodi addons to users because there are official organizations that work hard to vet these common Kodi addons. These addons have the further benefit of streaming only legal content. Moreover, since these add-ons belong to the official Kodi repository, they are way less likely to involve themselves in pirated content. This is the add-on for people who want to watch BBC TV and radio programs. BBC offers all those via the iPlayer. As far as the Kodi universe is concerned, the BBC iPlayer add-on comes in the form of iPlayer WWW. It is just a simple add-on for Kodi. With this add-on you can easily watch live TV, radio content, catch-up TV and lots of other content from BBC official iPlayer website. Users have to keep in mind that the majority of the content they will find here will only work in the UK. Hence you will either have to move to the UK to view content from these add-ons or you can simply subscribe to a VPN service. Users also need to realize that not all VPN services work with Kodi. BBC iPlayer has banned a lot of VPN services in the past many months because they don’t want viewers outside the UK to view their premium content. Our research shows that you should be golden with IPVanish. Click here to subscribe to IPVanish from the official website right now. It is totally legal to use BBC iPlayer if the user is a UK resident and has a valid TV license. Kodi users can install the iPlayer WWW from the Official Kodi Addon Repository. There are a ton of guides on the internet that show you how to install iPlayer WWW on Kodi, so read those if you don’t already know how to install it on Kodi. Kodi users who have an interest in integrating premium paid streaming services such as Amazon Prime Video, Hulu and/or Netflix directly into Kodi should give this add-on a thought. The PlayOn Kodi add-on is the best cross-platform streaming Kodi add-on that you are likely to find. But it doesn’t come from free. It will cost you a miserly $2.50 per month. This is a streaming DVR add-on that can save video files. And it can do that in a variety of formats such as the MP4 format. Users can later use the content downloaded for playback. PlayOn also includes other features that allow users to actually skip various types of ads. Kodi users who want to record videos will have to use a Windows PC in order to do so. They will also have to take advantage of PlayOn Media Server application. Now, what we have described just now is the best case scenario. In other scenarios, it is perfectly feasible for users to have another operating system and still make this Kodi add-on work like a charm. Just as before, using PlayOn is comprehensively legal. In fact, it is a rather interesting method to connect to one’s paid premium streaming accounts. 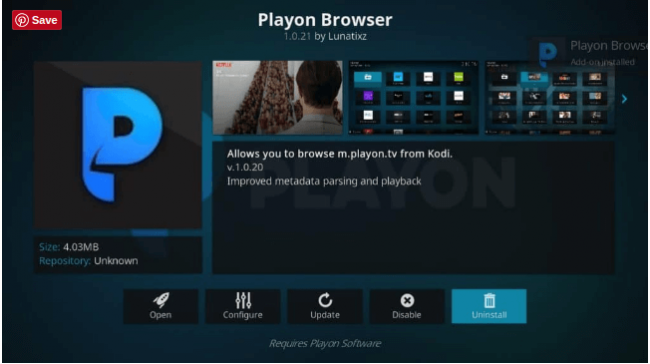 PlayOn integrates with the official Kodi media player as well. We have already mentioned the fact that PlayOn doesn’t come for free. But you can subscribe to the service from its official website and then take advantage of the 30-day money-back guarantee that the service offers with each of its packages. And as always, you can always come back to the Official Kodi Add-on Repository to find PlayOn in it, ready for you to download it and enjoy. No one needs an introduction to what is YouTube. Or what does it do. It is the single most popular source for viewers to watch all kinds (and by that we do mean all kinds) of movies and TV shows. If there is a movie or a TV show that you want to see, it will be on YouTube. That also holds true for video clips as well as full episodes. And rest assured that if you can find something on YouTube, then you can also find that content easily and quickly on the Kodi YouTube addon. But hang on for a second. The best part of YouTube Kodi add-on is something else. The best part is that, the YouTube Kodi add-on offers a far superior experience when compared to when a user accesses YouTube via a web browser. Accessing YouTube through a web browser isn’t fun. Neither is any other option apart from the YouTube Kodi add-on. We say that because the YouTube Kodi add-on allows users to bypass all of the annoying stuff like video suggestions and side banners that you see on the official YouTube website. When you view YouTube content via the YouTube Kodi add-on you don’t even have to sit through though irritating advertisements that always ruin your streaming experience before you sit down and start to watch a video or two. The very important thing users need to understand here is how does YouTube work on Kodi. Before you can view YouTube content with the YouTube Kodi add-on you must pair your device first. If you don’t do that, then you can’t access any YouTube content via your Kodi setup. When you install the YouTube Kodi add-on and launch the application, the application will want you to hit the sign in button. Once you hit that button, the application will give you an activation code. It will then prompt you to make your way to youtube.com/activate in order to pair your device. Once you have done that, you may watch YouTube all you want from your Kodi device. Sometimes, the activation code doesn’t work and you can’t pair your device. In that case, you will have to activate and pair your device twice in order to make sure that it works with your Kodi device. 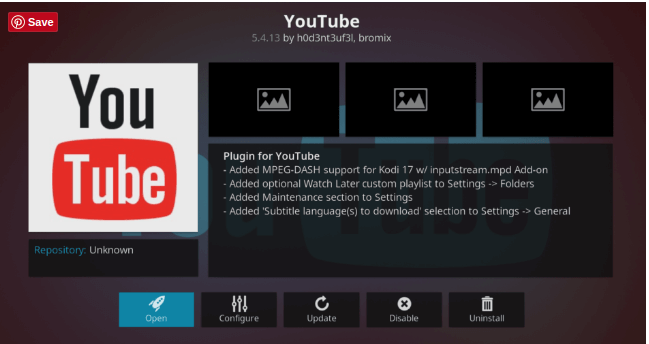 The Official Kodi Addon Repository will show you the way to installing the YouTube Kodi add-on. Just for information’s sake, YouTube is also a totally legal option for users to stream video content. That doesn’t mean that YouTube doesn’t have any pirated content on its site. But it is rare for users to run into that while they are accessing YouTube via the YouTube Kodi add-on. YouTube is usually very quick when it comes to taking down content that is pirated. USTV Now represents the most interesting Kodi add-on. It is a service actually. And although developers have designed the add-on specifically for people living in the US, it works for everyone. Initially, USTV Now catered to the military service women and men. It also aimes to attract expatriates living outside the US. But now, pretty much any online user can go ahead and sign up to use the service without many problems. USTV Now requires users to pay $19 per month in order to view 28 cable channels. It also has DVR services but they are limited. Users who want to view more content via the USTV Now add-on may pay the add-on service $39 per month. This more expensive package enables the unlimited DVR service from USTV Now Kodi add-on. With USTV Now installed on your system, there is no reason for you to not go ahead and access hundreds of TV shows and movies. Even shows that you saved previously via DVR. USTV Now also offers on-demand replays. Users have the opportunity to access lots more content using the USTV Now Kodi add-on. At the time of writing this report, the community considered USTV Now as legal. The reason we say that is because the official USTV Now Kodi add-on is available in the Official Kodi Addon Repository. With that said, USTV Now also has an older version. And this version may not work with your Kodi setup. So stay away from the older version. USTV Now deserves an installation guide of its own. It is a good idea for you to search the vastness of the internet for a proper guide on how to install USTV Now for your Kodi version. However, for the latest version of USTV Now Kodi add-on you can check out unofficial Kodi repositories such as Kodisrael and SuperRepo. Click here for a guide on SuperRepo. And click here for a guide on Kodisrael. It also goes by the name of PS Vue Kodi Add-on. Whichever option you take, it will still provide you with its new TV streaming option. But first, you will have to sign up for an exclusive PlayStation Vue account. Depending on your setup you may not have to go to the official website of PlayStation Vue to sign up for an account. 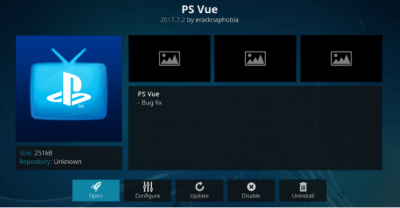 If you have the latest version of Kodi you can easily access the sign-up page from Kodi using the PS Vue Kodi add-on. Just make sure that you install PS Vue from nowhere else other than the Official Kodi Addon Repository. Just like USTV Now, PS Vue doesn’t offer its services for free. It is slightly expensive if you ask us for an honest opinion. To use PlayStation Vue Kodi add-on you will have to shell out $39.99 per month. For that price, PS Vue offers users a DVR option. The DVR option can come in real handy if you want to record movies and shows. But since PS Vue costs so much, it tries to make up for the higher cost with features such as on-demand TV show streaming as well as movies. This is pretty similar to what you would expect from a premium cable subscription service. As you can probably tell, the PlayStation Vue is a completely legal service. If you connect to this service and access its content via the official Kodi add-on, you are not violating any copyrights. As mentioned before, the only way to connect to the PS Vue service is to sign up for the service by creating an account. After that, you will have to install the Kodi addon for PS Vue and then use your account credentials. If you are on the lookout for tons of films to stream and stream those movies in a legal manner, then look no further than FilmRise. Granted, FilmRise is actually a little-known Kodi add-on. But that doesn’t mean it doesn’t offer a great service. In fact, we are pretty sure that you might consider this add-on your favorite Kodi add-on once you get the hang of it and experience what is on offer. As the name suggests, the FilmRise Kodi add-on is an add-on about films. FilmRise, as a company, is a film and TV distribution one. It goes about its business by acquiring licenses. And then it continues forward by offering the licensed content for free via various online platforms. FilmRise currently offers users around 7500 titles. It distributes them and makes it easy for users to have access to them by uploading them to sites like YouTube. And you know that if something is available on YouTube, then you can view that content via the official YouTube Kodi add-on. Now, the other thing you need to keep in mind is that there are multiple FilmRise Kodi addons. The specific one that you would want to install if called FilmRise-YouTube. Because the FilmRise-YouTube Kodi add-on offers access to the complete library of content that FilmRise has. Of course, all of the company’s content is available for free on YouTube. If you are worried about running out of content then don’t. Because FilmRise will probably continue to add more content to its library. Even if it doesn’t, it already has enough quality content that will last you more than one lifetime by our calculations. The FilmRise Kodi add-on, just like all the others we have mentioned till now, is available for download via the official Kodi Addon Repository. You already know what Crackle is. So there is no point in going into the details of what it does and how it does it. What you need to know is that the Crackle Kodi add-on feeds the official Crackle movie and TV show library directly to the XBMC or Kodi platform. And it does that for free. When you hear the word Crackle and Kodi together, you may find yourself thinking about some things. The first thing that people think about when they hear the word Crackle is how is the content that this Kodi add-on offers is legal. Well, Crackle basically leverages a wonderful situation. All of its content is legal because Crackle works as Sony’s online video library. This online video library is free. Most of its content is actually films that Sony has licensed in the past. This allows Crackle to offer a wide range of movie content. And if there is one thing true about Sony then it is that Sony is actually a movie powerhouse more than anything else. Hence, it should come as a no surprise that we have some high-quality movie content on Crackle. Some of the best movies that Crackle has on offer include Ali, the boxing movie starring Will Smith. There are lots of other films as well. You will have to check them out yourself to know if they suit your tastes. As with the FilmRise Kodi add-on, there are lots of version of Crackle. You need to make sure you get the one that offers the most content and does it legally. So don’t just install Crackle from any given Kodi add-on repository. Our research shows that you are better off with the Crackle add-on that comes with the eracknaphobia’s Kodi add-on repository. This is the place for license-free and classic films. Then this Kodi add-on is made for you. Remember, that even though we have referred to this add-on as Internet Archive, what you are actually looking for is Internet Archive [Video]. 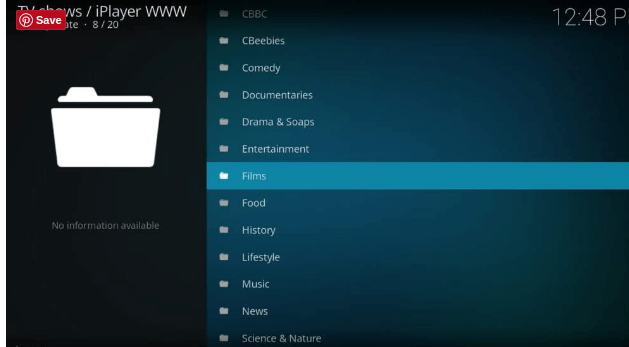 This Kodi add-on represents a rather massive online database. It is replete with all types of online content. It has software-related content as well as audio content. Think of the Internet Archive as the Library of Congress as far as the internet is concerned. The reason why people call it that is because the Internet Archive also offers a ton of video content via its video library. And you can access it all through a simple a software as Kodi. We haven’t even reached the best part about this Kodi add-on. The best part is, it is free. You will not have to go through any paywalls. You literally need nothing else apart from Kodi to view any Internet Archive content. Internet Archive will right at home to you if you are into the classical content of various types. What about the legality of this Kodi add-on? The Internet Archive [Video] add-on works within the limits of the law. In other words, it is totally legal. But you will only waste your time if you look for this Kodi add-on in the official Kodi Add-on Repository. Well, to get this add-on you’ll have to call on the services of the SuperRepo Kodi add-on repository. We have already noted the fact that SuperRepo is a huge Kodi repository that contains many unofficial add-ons as well as official Kodi addons. Hence, in a situation like this, it is always better to exercise a bit of old-school caution. SnagFilms is also a TV distribution and film company. In fact, they have a very similar business model when compared to FilmRise. Both SnagFilms and FilmRise like to acquire complete movie licenses. They also do the same with TV shows. Then, they move ahead and offer all of their content on various online platforms for free. When compared with FilmRise, SnagFilms has the smaller content library. But even then it is pretty big. It offers over 5000 TV shows and movies. All of them are just waiting for you to watch them. SnagFilms provides Kodi users to enjoy a big selection of content without any cost and legally. All you have to use if the official SnagFilms Kodi addons. Kodi users who want to download SnagFilms can do so via the official Kodi Add-on Repository. Viewster is a streaming service that is based in Switzerland. And just like most other Kodi addons on this list, it too offers free TV shows and movies for Kodi users. The best thing about Kodi addons such as Viewster is that users are free to watch content from anywhere. Kodi users who are fed up with issues such as region locking will find Viewster as the best Kodi add-on. Because it aims to offer content to an international audience. Of course, Viewster won’t work in places where users have to experience content filtering via government agencies. We are talking about countries such as China and the rest. Regardless, Viewster features a pretty good amount of quality content. It is mainly concerned with anime content. But you should not have problems in finding original and licensed TV shows along with movies. Most of these items are such that you will not find them anywhere else on the internet except on Viewster. As with all other Kodi addons mentioned here, Viewster is available for Kodi users to download it from the official Kodi addon repository. What’s the one word that you would use to describe Big Star Movies add-on? Big Star Movies also has an official website. And the Big Star Movies add-on pulls content from that large free library. If you are looking for unique movies and TV shows that stretch across all genre and popular categories then look no further than Big Star Movies. Fortunately for all Kodi users, the official Big Star Movies official Kodi add-on organizes its content very well. It scraps the official Big Star Movies Kodi add-on for the latest content which belongs to the most popular and major categories of movies and TV add-ons. The Big Star Movies official website also offers a premium service. As the name suggests, this service is the gateway to premium content. But the premium content is not available on the Kodi platform. Once its Kodi add-on becomes available on Kodi, we’ll update this guide. The other thing Kodi users need to note down here is that Big Star Movies does not give users any options to log in via their Bit Star account from within Kodi in order to access their content. As far as the legality of this Kodi add-on is concerned, we can assure you that the Big Star Movies Kodi add-on is legal. And of course, it is essentially free. You won’t find it in the official Kodi Add-on Repository though. Instead of searching for it there, you should find the most trustworthy and updated version of a Kodi repository that goes by the name of MetalChris Repository. People who are interested in British TV should know that they don’t have to settle for BBC iPlayer alone. 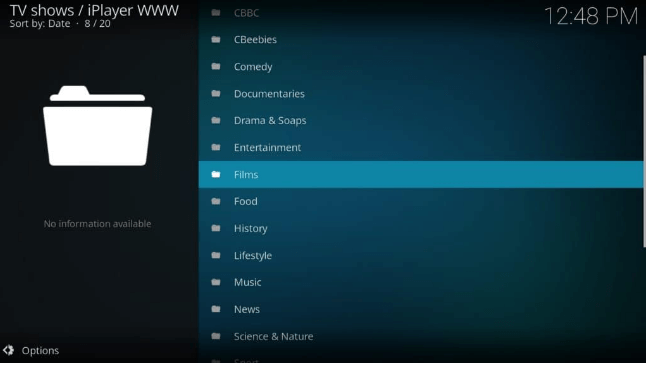 The ITV Kodi add-on is for Kodi users who want a load of quality content. This Kodi add-on supplies users with a nice mixture of on-demand streaming and live TV streaming content. Its content will likely have your favorite movies and TV Shows. Want to access all of the content that ITV Player has? The ITV Player add-on also has content on American TV shows. Just like some of our previous add-ons, this add-on has actually licensed some American content which is very popular in the United States. The only problem with ITV Player is the same one as with the BBC iPlayer. Both like to region lock their premium content. However, there is no need to panic. BBC iPlayer is more stubborn than ITV Player. We say that because in order to access ITV content you don’t necessarily need to have a valid TV license. All you need is a decent VPN service. So sign up for a VPN service that lets you connect to a British server. That advice is for people who live outside the UK but want to watch iTV content. So where can you find this Kodi add-on? Not in the Official Kodi Add-on Repository. You’ll have to find the official ITV Kodi add-on in the official noobsandnerds Kodi Add-on Repository. The UKTV Play Kodi add-on is yet another competitor for the already very established BBC iPlayer. The UKTV Play can boast up to 41 million online viewers. And perhaps it deserves all that success. Because it furnishes Kodi users with a load of high-quality and unique content. It also comes with some of the reasonably popular titles on TV. There are too many popular shows for us to list out here, but you will have plenty of time to discover them all once you download them. There are no live streams, however. But when you have a Kodi add-on that provides this much content, you will not need it in any case. The UKTV Play add-on is a fantastic Kodi add-on for all those Kodi users who want on-demand content. If that’s your thing, then you must add this Kodi add-on to your repertoire. Most of the content that UKTV Play offers comes for free. But as with BBC iPlayer and ITV Player, you will need to have a VPN service with a VPN server in the UK to unlock all the content if you don’t live in the United Kingdom. In total, you will come across two UKTV Play Add-ons. Our research forces us to recommend users that they should go with the version that is available for download from the noobsandnerds Repository. This repository comes to you from Catchup4Kodi. The reason we recommend this version is simple. And offers users a menu that works like a charm. These are the add-ons you need to pay attention to in order to maximize your Kodi streaming experience. Do let us know your thoughts if you come across any problems while finding and/or installing these Kodi addons/repositories. Stay tuned for part two of this super awesome guide where we list out the best repositories for Kodi and one bonus Kodi add-on along with information on how to stay safe with Kodi and why you need to exercise caution when using Kodi. Robocalls Rule Cancelled. Ajit Pai Can’t Celebrate Enough.